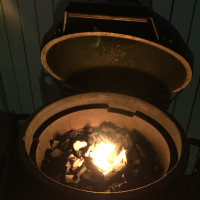 We like crispy chicken skin and I was wondering what dome temperature to set the BGE or what cooking grate temperature?. I go indirect at about 400 for 45 minutes. Crispy skin, tasty chicken. Leg Quarters direct at 350*. Maybe 35-40 min. More important than temp is letting the bird sit uncovered for 24 hrs prior to cooking. Also, no oil. Only dry rub. I like 350-400 for cook temp. No edit on iPhone. Let bird sit uncovered in the fridge. Travisstrick is all over it. I've even gone 48 hours uncovered in the fridge. More important than temp is letting the bird sit uncovered for 24 hrs prior to cooking. Also, no oil. Only dry rub. I like 350-400 for cook temp. I did some real low effort wings this weekend. Platsetter, feed up, at 300F. I dry rubbed the wings, spread them around the grate and left them for 2 hours (straight from the fridge). The skin was crispy and the meat was moist. I was surprised the worked out that good with 3 minutes of prep. i get really crispy skin straight onto the grill from the package, used to wash it first but it doesnt matter. the trick is to cook it skin side down raised grid direct til the skin is crispy, then flip it. the grease builds up between the chicken and skin and starts to crisp, when you now flip the chicken the skin is still lifted off the meat and further crisps. seems everyone starts their cook skin side up for reasons unknown, dont do that, it keeps the skin touching the moist meat which in turn keeps the skin wet, eventually turning to rubber. thighs and wings cook to 190 or even a little more internal, breasts are done in the 160's, the trick with the breasts are to get them whole as they are larger and cook longer. most supermarkets split the breast. cook the skin side first, cook it til crispy, then flip and cook til the chicken is too your liking. Thanks, guys. I should have a little clearer in my question. I am talking about crispy skin when roasting a whole chicken. What temperature is best. ummmm, I don't see any techniques that won't work for you. Crispy skin is crispy skin, regardless if it's chicken parts, or a whole chicken. If doing a whole chicken, going spatchock would allow you to do it the way Fishlessman is talking about (still don't see the difference in technique between a whole chicken, and chicken parts - unless you're assuming that a whole chicken is cooked standing up, ala the "beercan" chicken method). BTW, the beercan method has been pretty much debunked as more of a "novelty" than an actual beneficial technique - most folks prefer spatchcocking, and there are some who do an "inverted" standing chicken (legs up) as they feel it allows the fat juices from the legs to drain down toward the breast. Also, most agree that higher temps (say, 400-450) help w/ the crispiness. 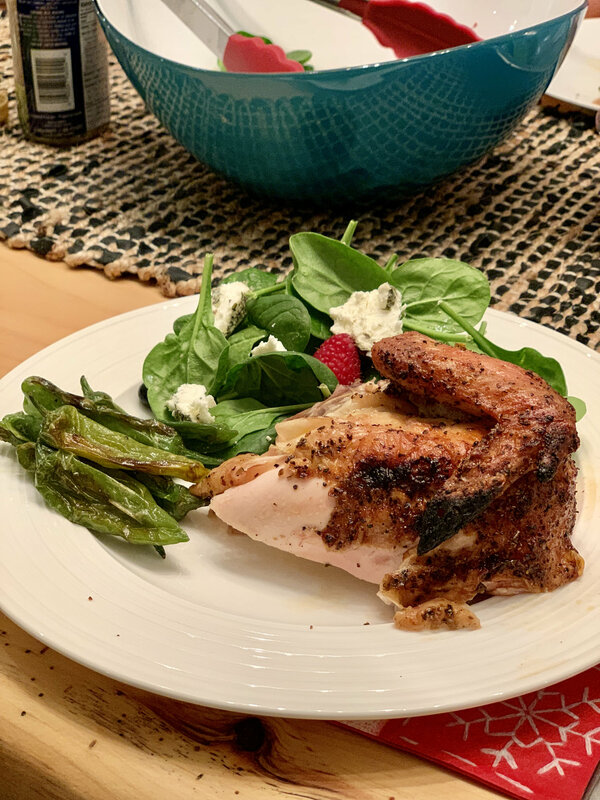 FWIW, the next time I'm in a mood for chicken, methinks I'll "age" it like in my post, then cook it like in Fishlessman's post at around 400-450 and see how that turns out. I wanna try this to see if I can finally get crispy skin. I have 2 questions: (1) What temp do you use? (2) Raised grill to phelt line or higher? The times I cooked indirect I got a strong smoke smell from the fat drippings but I am willing to try again for good crispy skin. Thanks! Raise above felt/gasket 3-4”. Use beer cans, bricks or weber grill with 4” carriage bolts. Cook at 400-425. Seperate skin from meat, cook skin down until it is starting to tighten up then flip. Pull by temp. Salt and leave uncovered in the fridge over night. Indirect 325-350 and spritz with butter throughout the cook. Spatchcock, poke holes through skin all over bird, especially in fat pockets, run fingers under skin to separate it from the meat, but don’t remove skin. Season with kosher salt, pepper and baking powder, let sit in fridge uncovered on a rack over night up to 24 hours. Cook raised at 400 or so. Start skin side down and flip about half way. If you are high enough in dome, you can go direct, otherwise go indirect. If you like, you can do a high temp sear, breast down at the end. This can be done however you want. In CI, or directly over hot coals. edit - also, when resting the chicken after the cook, leave it uncovered to avoid trapping in steam. What about baking soda or powder? Isn't one of them is supposed to help crisp the skin? And I forgot about corn starch?? ?